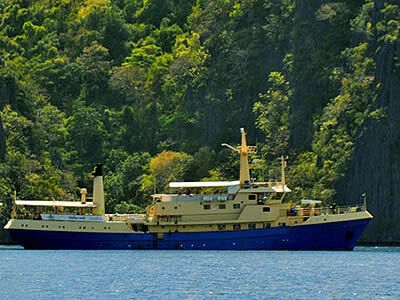 A voyage on the M/Y “Hans Christian Andersen” is the perfect way to explore the charming archipelago of the Philippines. Here you can unwind in a relaxed and unpretentious holiday atmosphere, you don’t worry about dress codes (unless it is your wet suit, of course), just enjoy the wonderful ship, the sight seeing, the land trips and most of all, the dive spots. The Andersen is not a dive vessel per se, rather an elegant little adventure cruise ship. The Andersen was built in 1972 in Holland and re-outfitted in 2006 under new, Danish ownership. Three routes are offered: the Northern Route starts in Puerto Galera and takes you south to the North Palawan region and Coron Bay, the Southern Route begins in Cebu and brings you to Negros, Camiguin and Bohol, and last but not least, the Tubbataha trips. The Northern and Southern Route are for divers and no-divers alike, en route you can dive everyday but there are also lots of other things to do. Every day you will have the opportunity to go ashore where you can swim or snorkel or look for local places to explore, like untouched tropical beaches, local marketplaces, museums or other places of interest. These trips are ideal for people who like to discover the Philippines above and below the water and for families with children. Naturally, the Tubbataha Route is primary for dedicated divers since you can’t go ashore.